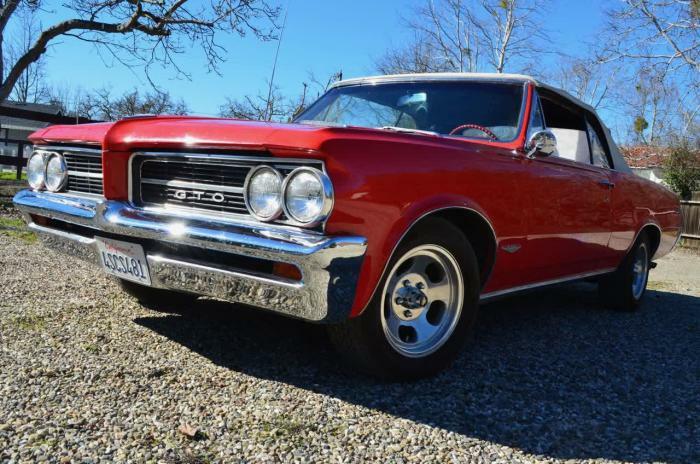 Offered here for your consideration is a 1964 Pontiac LeMans Convertible with dealer installed GTO options. The odometer reads an incredible 21,297 original miles since new. Discovered in a small town near Santa Barbara, California, the vehicle remains in remarkable, original factory condition. The owner retains over 40 years of documentation. Recently inspected and appraised by Polk & Associates, the car is rated an overall #2 vehicle: (Excellent / Low Mileage with Maintenance Records). Original paint is graded at #3: (Very Good / Above Average / Well Maintained). A very detailed and informative inspection report researched from Polk & Associates will go with this sale. Power is provided by a 389 V/8 with Tri-Power matched to a factory 4-speed standard transmission. Factory vinyl interior upholstery is outstanding. Interior hardware, control levers, handles, dashboard, garnish moldings, steering wheel, dash pad, seats, doors, panels, headliner plus sun visors are rated #2 (Excellent). Back seating appears to be rarely if ever sat in. The spare tire including tools are still mounted in the trunk. The trunk's bed and flooring also received a #2 rating. (see photos). All-in-all this is an outstanding discovery which remains in excellent original condition. The dealer installed GTO options were painstakingly mounted. An original set of wheels, tires and hubcaps will also be included with this sale. Please take the time to view a short youtube walk-around video with the car in action. Click Here to watch a video of this car!